The Release 7.19 of Pangea Digital will bring improvements to existing features as well as the new solutions based on a feedback from our users. We would like to present all components we have been recently working on. For your convenience we have created Release Highlights in PDF format which you may download HERE. 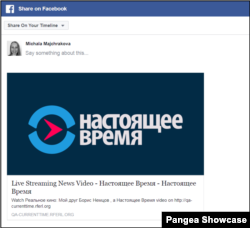 We developed a dedicated live media page for services that use TV streaming and record the shows in Pangea. The new live page will give web users option to watch a live show, check what has been recorded recently and to see what is coming after a live show is over. The new live media page contains a player, show zone, title, description and the share buttons. The description is hidden by default, but users can chose to open it to get more information. There is a playlist on the site of the page which consists of upcoming shows, the live show and recordings. There are new configuration keys to set up the amount of the shows appearing on the playlist. A service can set up how many upcoming shows (as default 2) and how many already recorded shows (as default 30) will be displayed in the playlist. For users, especially ones on mobile devices, it`s important to know how long a video will take, so we have implemented the video time duration in the playlist. Data for the upcoming shows is taken from the scheduler before the show, so we strongly recommend services to set up a show properly. After the show is over, the system will encode the video file. If the show is not in the published status (= not ready) and the recording is not checked in Pangea CMS before the show, the show will be not published on the media page. Once a show is ready, file is successfully encoded and the status of the file is published, the show will appear automatically on the page in the playlist list chronologically (from newest to oldest). If a service changes the meta data (title/ description) in the record in a video-edit page, the media page will be updated as well. The live media player page is a new page and will not replace a tube page now. 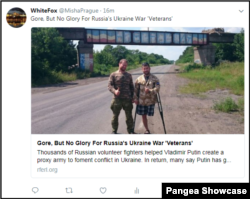 If a service wants to promote the, they create a link to /live/video in a navigation (for example https://www.svoboda.org/live/video). In case a service has more tubes, the tube navigation appears on the live media page and the web users can switch from a tube to another one to watch a show. We advise services to see the tubes in the navigation and remove the tubes in Pangea CMS if they do not use them. 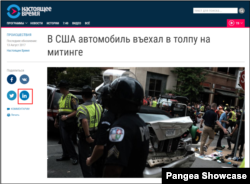 A web user can share a live media page of a tube. 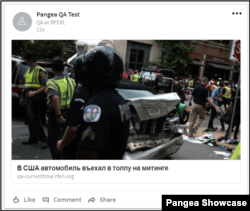 While sharing on social media, the image is taken from the tube settings in Pangea CMS. Please, double check the image in the Tube settings and if missing, set it up. Also, take note of all relevant localization keys before launching the page. 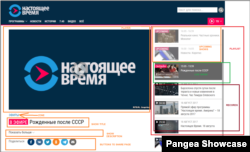 When a web user opens the live media page and there is a live show, the user will see the live show. If auto-play is enabled, the live show starts to play automatically. If there is no live show, the latest recording is played, assuming the service records the show and the show is in “public” status. Also, if auto-play is enabled, the next recording(s) plays, so web users can watch shows automatically without having to interact with the webpage . This page also works on non-java script devices. All configuration and localization keys are provided in the PDF version of the Release Highlights which you may download in the introduction of this article and also HERE. To further improve UX for embedded videos, we have expanded the sticky player functionality for Facebook videos embedded to article pages. Our users are now able to watch embedded Facebook video content while reading the article. For services that would like to promote a job position page (RFERL sites) or a content page, we developed sharing via LinkedIn. If a service wants to start sharing via Linked, a web admin should localize the share button hint and set up LinkedIn to the configuration for Sharing buttons. There is a new configuration key to add any text and link in a Contact Us widget. We recommend webmasters who have already created an extra HTML widget with text and link for Terms and Conditions which appears at the bottom of the Contact Us widget, to replace the widget with the new configuration. In previous Twitter card implementation, we used "twitter:card" content="summary_large_image" for articles. We created a new configuration to have twitter:card" content="summary" for a content if no image. In this release, we implemented visited link functionality to the following frontend content: widgets, zone archive pages (content/ radio/ TV) and authors page. We added functionality to the Akamai Apology pages -- pages which are used when our websites are not available. This design offers web users to go to services’ social media accounts, if interested. The primary goal for this feature is to provide an emailer “subscription widget” to any topic. Before creating a subscription widget, please check if you have at least one emailer topic in Pangea CMS Emailer tool (CMS > Newsletter > Newsletter topics). As soon as you have at least one emailer topic created, you can start preparing the Subscription widget. The widget can be created on section level or in a widget library. If you are on section page, you can just click on green plus (empty widget space) and a modal pop up window appears where the subscription widget is listed. This can be applied not only to a section, but a region as well. If you have subscription widget created, you can also embed it into the Article body so it will become part of it. If you are inside of Article editing you can go to CKEditor tool bar and click on Red-arrow icon which you are using for embedding of external content. A pop-up window with 3 navigation tabs will appear. The third one called “Embedable widgets” is NEW. This tab allows you embedding this new type of widget into article. While you open this tab, you have listed all created widgets and by clicking on green plus are automatically embedded into article body. We are following classic features like enabling or disabling the widget, so keep on mind that if you already put widget somewhere and then you decide to disable it, widget will disappear from live page. “Title of widget” will be shown on front end so visitors of website can read the title of widget + topic which they are subscribing. “Widget name” is only for internal purpose so no visitor can see it. “Is in Widget Library” is showing the status if the widget is part of library. You can add created one from section by each widget or directly inside of widget library. “Select Topic of the Newsletter Subscription” you are choosing from existing emailer topics. “Show link to Terms and Conditions” is enabling on the front end the shortcut to terms and conditions which should be part of it every time because of law. Link to Terms and Conditions can be defined via config keys. “Show link to ALL Topics (subscription page)” is enabling on the front end the shortcut to all topics page if was defined before and set in config key. Configuration keys for widget you can find under settings of Pangea CMS and also they are listed in the PDF version of the Release Highlights which you may download in the introduction of this article or HERE. We have updated the component we use for the upload of single videos – from 7.19 on, the behavior of a single video upload and video batch upload will be the same. Display authors on certain layout of infographics – layout C, that support e.g. social buttons, page header etc. For a TV zone, it will be now possible to add relevant articles to the program / zone, and we will display them on the zone archive (same as we do for Radio zones). The article tab can be enabled and set to default on the zone settings page. The localization of the tab will be the same as we are using on the Radio zone. In this release 7.19 we are rolling out a beta version the new re-designed sections pages in Pangea CMS. The pages offer a much better User Experience and a modern design. We will be rolling out this to selected services at the beginning, if your service would like to be part of the beta version please let us know so we can enable the beta sections for your service. How to Access the Beta Sections? In this new version, you will notice that you will have the option to start adding widgets even before the settings of the page are defined. This will allow you to setup all your widgets and content right away and once the section is ready to go live, you can change the status from private to public under settings and update all the metadata required for making the page live. This will allow you to see how the page will display in different screen sizes: Large for desktops, Medium for tables and Small for mobiles. This view will allow you to see how the page will really look on the website. Widgets that are disabled will not display. A new window will display with all the available settings for the widget; once this is done and you save the widget, it will be added to the page. This option allows you to select widgets that are saved on the widget library. Like the widget list, it functions with drag and drop. Once you drop the widget in the select area, a modal window will display with the option of widgets available. The pages have 2 states: private and public. This status can be updated in settings page. Here you will be able to modify the title of the page, add metadata and manage the status of between private and public. Tool to build section layouts (user rights only). Editors will have the option to move widgets from one area to another via drag/drop on a different area. If the area the widget is dropped already contains a widget, the system will ask you if you want to switch positions of the widgets. This button will take you to the page where all pages are listed. If you have any further questions regarding new functionalities, please contact our Customer Care team. We are pleased to inform you that we extended our newsletter feature to allow you and your designers to create beautiful newletter's designs with full width images and more to not only promote your articles published on homepage, but also those that are exclusivelly available to your affiliates on DIRECT. You may find all variables and how to use them right from the template edit page in CMS.